Now that the 2012 presidential campaign is over and we can all breathe a sigh of relief from robo calls and television ads, it’s time to think about what to do with those bumper stickers, convention badges, political buttons and assorted merchandise related to the campaigns. Anderson Americana, an auction company which regularly holds auctions of political and historical memorabilia held an auction July 10-11, 2012. A catalog of this auction is available from Anderson Americana, Troy, OH. The most expensive button sold was the 1960 campaign between John F. Kennedy and Richard M. Nixon. The 4 inch celluloid button with “America Needs” and “Kennedy” centering a black and white photograph of John Kennedy sold for $806.00. A 1948 “Truman for Me’ celluloid 11/16” button sold for $50.00. One of the common terms found in descriptions of political buttons is “jugate”. This means the button has a pricture of the presidential and vice presidential candidates side by side. Like all collectibles the older, rarer, and mint condition buttons are generally more valuable than those with missing pins and damage. A 1904 campaign campaign button printed in red, white, blue and gold for the Democratic candidates, Alton Parker and H. G. Davis centered by an image of the Democratic elephant surrounded by various slogans and in fine condition was reported as valued at $644.00 in the 2008 Antique Trader Collectibles Price Guide. Not all campaign buttons are old. Reproduction buttons have been issued in 1972 and later dates. If you are considering collecting visit the web pages of collectors such as Hake’s Americana & Collectibles, Ron Wade, John W. Davis, E-Bay, Legendary Auctions Seacom Enterprises. 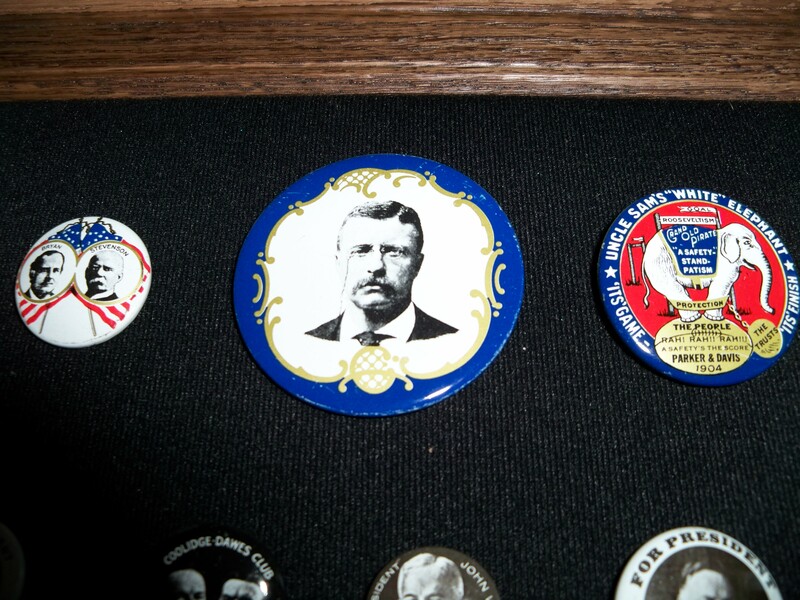 These web sites provide an education in the collection of political memorabilia. “One Big Happy Family” room display of Grape and Cable pitchers, tankards and tumblers. The International Carnival Glass Association Convention was held July 11-14 in Springfield, Illinois. Attendees at the convention were invited to visit individual collectors rooms where displays of carnival glass were presented. A display of colorful five-inch to seven-inch plates of many patterns and finishes was available for viewing in the main convention room. Visitors to individual display rooms were able to learn from the collectors about patterns from various manufacturers and countries. One room display featured glass from Germany, England and Czechoslovakia. 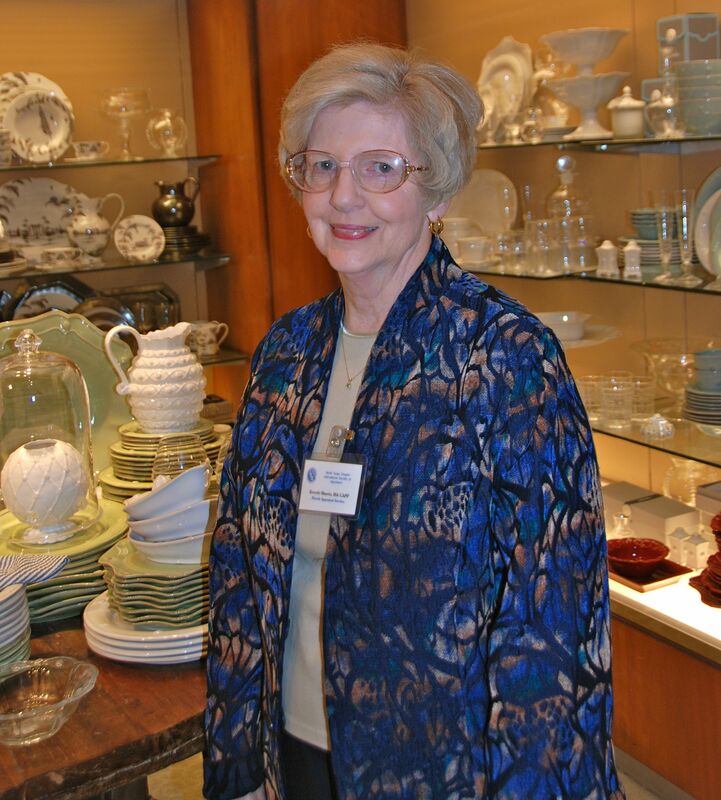 Seeck Auctions ended the convention with the sale of a portion of the Leonard Collection of carnival glass. Details of the auction will be included in a future post. ISA is pleased to announce the award recipients from the 2012 Awards Luncheon. Beverly Morris, ISA CAPP, International Society of Appraisers Certified Appraiser of Personal Property received the Distinguished Service Award at the ISA Conference in Tempe, Arizona April 24, 2012. Ms. Morris has served as chair of the Ethics Committee, Specialty Studies Committee, and Chapter Networking Committee for ISA. She is a former secretary, vice president and president of the North Texas Chapter of the International Society of Appraisers.